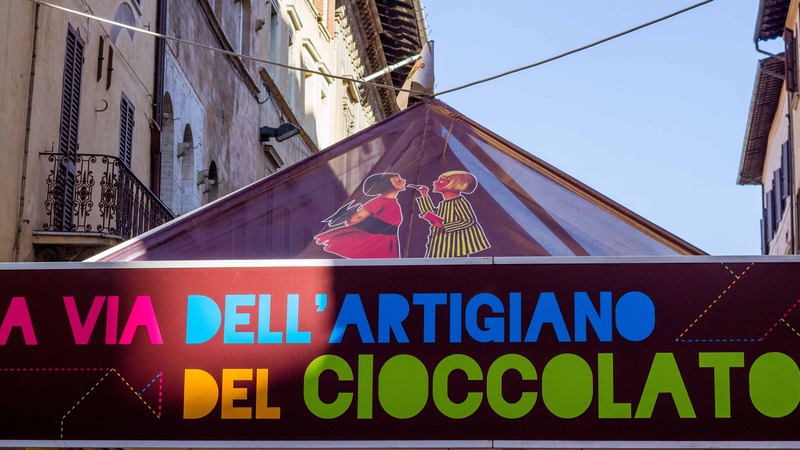 Every year in Perugia, Italy, there is a 10-day-long chocolate festival known as Eurochocolate. It is a chocolate lover’s paradise. Bring your wallet and sweet tooth because you’ll definitely be needing both. During October 2017, I was in Italy for a week for our destination wedding. We stayed with 20 of our friends and family at Le Torri di Bagnara, a 30 minute drive from Perugia. The first day of the festival fell on a Friday, our last full day at the villa. The majority of our guests planned on attending the festival. The concierge at the villa told us that the first day of the event is usually the least crowded day, and she was right. There was a decent sized crowd, but I think a lot of events occur later in the week. Some of the main streets in Perugia’s city center are lined with booths selling varieties of chocolate, souvenirs, and games. If you don’t have room in your suitcase for souvenirs from the Chocostore booths, no worries! You can purchase items online. There’s also large displays incorporating chocolate in unique ways, including a Volkswagon Beetle covered in chocolate and a grand piano covered with 1500 tablets of dark and white chocolate. One end of the Festival is located in the main plaza, Piazza IV Novembre. Aside from chocolate vendors, you can also visit historical landmarks and museums. The Piazza was originally named Piazza Grande until 1918 when its named changed to Piazza IV Novembre to celebrate the day World War I ended in Italy. In Piazza IV Novembre, you’ll find the Fontana Maggiore (a 13th century fountain), the National Gallery, Galleria Nazionale dell’Umbria, and the Catholic Church, Cattedrale S. Lorenzo. Head south down Corso Vannucci to another square, Piazza della Repubblica, and you’ll be in the middle of the festival and near a restaurant I recommend for lunch (see below). It’s more like a wide street than a square. Behind the street lined with booth you’ll see the Restaurant name above an archway leading to an alley – follow the alley down to the restaurant entrance. Continue down Corso Pietro Nannucci to the other end of the Festival is located at Piazza Italia. This piazza is surrounded by government buildings, including the Donini Palace, the Umbrian Regional Council, and the Prefecture of Perugia. In the middle of the Piazza is a statue of King Vittorio Emanuelle. During the festival, there are several booths with games and music. It appeared to be the fun side of the festival. Across the street from the park and piazza is an excellent overlook spot. Don’t forget to venture off of the main street. There are more pop-up stores and booths located along Via Sant’Andrea to Via Baglioni, and along the streets located between the two main streets. If you need to walk off all the chocolate you’ve eaten, consider walking the streets where the old Aqueduct once flowed to the city centre. The aqueduct was built in 1254 and ran along Via del Fagiano, Via dell’Acquedotto and Via Appia, approximately 3 km long. It’s ending point was Piazza IV Novembre at the Fontana Maggiore. Today its a lovely stroll, at times above the city streets. I was too distracted by chocolate to do this path, but I would have loved to see the city from this perspective. One of the most well known chocolate brands at the festival is Augusta Perusia. This is the company’s first location, which opened in 2000. You can visit the chocolate shop and gelateria at its location on via Pinturicchio. There is another chocolate and coffee shop located on via Bonazzi. If you want to watch the masters at work, head to the last location at via Piccolpasso. This store is the latest addition to the company’s stores in Perugia, opening in 2016. To find out more about this artisanal chocolate atelier, check out the website here. Even if you don’t visit Perugia during the Chocolate Festival you can still buy chocolate from the famous chocolate shops. Chocolate Shop Perugia is located along Cora Pietro Nannucci. A Chocolate Artisan Shop and the Eurochocolate Shop are both located in Piazza IV Novembre. One of the chocolate brands you’ll see at the Festival is the Perugina Baci. You can take a tour of the factory where these little chocolate treats are made. The factory is located outside of the city (Van San Sisto 207, Perugia, Italy). You’ll probably see the word “Nestlé” around the building, as the company purchased Perugina not too long ago. A tour of the Casa del Cioccolato (Chocolate House) includes the factory and the museum, Museo Storico Perugina. The tour lasts between 1 and 2 hours and cost €9 per adult. To book your tour, click here. For those planning on visiting the festival for a few days, consider purchasing a Chococard. It costs 6 euros and can be purchased at the Chocostore online or at the event. You can use the card for special offers, discounts, and other benefits while touring the festival. Participating restaurants will give you a discount on your bill when you use your Chococard. Participating hotels offer fixed rates or discounts on amenities for Chococard holders. Stores offer discounts to Chococard holders on certain types of merchandise. You can find out more about these benefits here. We parked outside of city center. The parking lot we were told to use was occupied by a carnival so we had to improvise. We parked at the Fontivegge Mini Metro station. Parking was free and made getting to the festival extremely easy. The last stop, and the station closest to the Festival, is Pincetto Mini Metro Station. To find out more about each year’s festival, check out the festival’s official website site (click here). The 25th Anniversary of the Festival is in 2018, so start thinking about making a trip to Italy now! The Festival will take place between October 18th and 23rd. Be sure to use the hashtag eurochocolate2018! October is a wonderful time to visit Italy. The weather is cool, the streets are crowded with tourists, and leaves are still turning colors. Check out my blog posts on visiting Assisi, Gubbio, and Florence for other ideas for your Italy vacation! Located behind the main streets, this quaint restaurant offers amazing meals and dessert. Umbria is known for its truffles and La Taverna serves several dishes dedicated to this regional staple. To find out more about the restaurant, click here to view its website. Have you been to the Festival or plan on attending? Let me know in the comments! Please note that as an Amazon affiliate member, I’ll earn a small commission if you purchase through the below affiliate links. Get the look! If you liked the Persol sunglasses my husband is wearing in our photos from this trip, check out the Amazon link below. These glasses can also be seen in La La Land, worn by Ryan Gossling’s character. If you’re trying to travel light and need some help, I recommend using packing cubes. This is the brand I purchased recently and it has changed how I pack forever. I was amazed that I could pack for two weeks (for a wedding and honeymoon) in a small carry on (plus backpack and bag for my wedding dress).